ASTM A516, identical with ASME SA-516, is the standard specification for carbon steel pressure vessel plates, for moderate-and lower-temperature service. 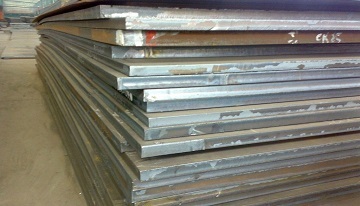 The major advantage of A516 or SA-516 steel plates is their low initial cost. These plates are primarily used for service in welded pressure vessels where improved notch toughness is important. They maintain good HIC resistance and are widely used in air liquefaction plants, refrigerating projects, transport equipment, and containment vessels operating down to -50°F[-46°C]. ASTM A516 grade 65 plates, 2 m(L) x 1 m(W) x 42 mm (THK). The SA-516/ A516 plates can be classified into 4 grades based on its minimum tensile strength in US customary unit: Grade 55, Grade 60, Grade 65, and Grade 70 which can also be specified in SI unit respectively: Grade 380, Grade 415, Grade 450, Grade 485. In practice, the maximum thicknesses of plates available are listed as follows: 305 mm for Grade 55, 205 mm for Grade 60, Grade 65 and Grade 70. *For each reduction of 0.01 percentage point below the specified maximum for carbon, an increase of 0.06 percentage point above the specified maximum for manganese is permitted, up to a maximum of 1.50% by heat analysis and 1.60% by product analysis. *Carbon Equivalent CE = C + Mn/6 + (Cr+Mo+V)/5 + (Ni+Cu)/15; for thk.≤ 25 mm, CE≤0.43; for thk. > 25 mm, CE≤0.45. *For hydrofluoric acid alkylation service, V≤0.02%, Nb≤0.02%, V+Nb≤0.03%, Ni+Cu≤0.15%, 0.18%<C≤maximum specified. *Yield strength is determined by either the 0.2% offset method or the 0.5% extension-under-load method. 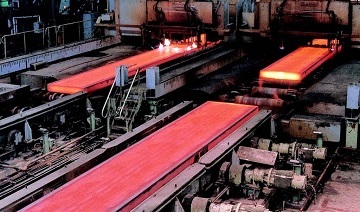 The SA-516/ A516 steel shall be made in an open-hearth, basic-oxygen, or electric-arc furnace, possibly followed by additional refining in a ladle metallurgical furnace(LMF), or by secondary melting by vacuum-arc remelting(VAR), electroslag remelting(ESR), or another method. For thickness ≥ 75 mm, it may be strand cast or cast in stationary molds. The plates usually run the heat treatment of normalizing and stress relieving. The steel shall be killed and shall conform to the fine austenitic grain size of grade 5 or finer. Relative tests that shall be performed generally include tension test, Charpy V-Notch impact test, ultrasonic examination, magnetic particle examination, and high-temperature tension test. The hot rolling production line for ASME SA-516 plates in Baosteel. Our company is a prominent supplier of ASME SA-516/ ASTM A516 plates holding a comprehensive range of materials in stock. All plates are sourced from prestigious steel mills such as BaoSteel, AnSteel, Hebei Steel, Wuyang Steel, etc with original mill test certificate available. Click to download the PDF file of ASME SA-516/ ASTM A516 for free.